Kate Alizadeh is a Cardiff-based illustrator who graduated from Falmouth University in 2013. After graduating she lived in rural France for six months, honing her illustration skills while clearing out barns and feeding chickens. She then traveled around for a few months until she wound up in Wales. In her spare time she enjoys sampling street food, listening to cool (and not cool) music and dodging buses while cycling round Cardiff. Sssh! Listen, what s that noise? Each room in a house has different noises and in this book the text and visual clues help a child experience the home through sound, which will be familiar to those children who are blind or partially sighted. 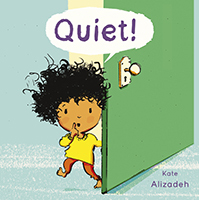 Features: The text and sensory clues in this inclusive picture book allow children to experience their home through the many noises it makes. Auditory landmarks help all children become familiar with daily routines, and can be particularly helpful for those with visual impairments. Hardcover format is beautifully presented in a dust jacket and makes a great gift.